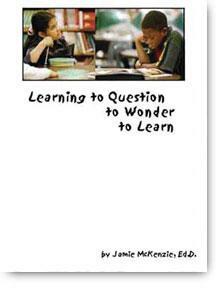 This book shows how teachers can equip young ones with questioning strategies to wrestle with the most difficult decisions and problems. For some four decades now, Jamie has been developing tools and models intended to strengthen student questioning and thinking. In Learning to Question, Jamie shares his best insights about sharpening the questioning powers of the young, emphasizing practical classroom strategies that teachers can use on Monday morning. This book is meant to equip teachers to nurture the sense of wonder of all students while encouraging them to explore, uncover, discover, invent and decide. Jamie shows how good teaching blends four elements: science, craft, art and alchemy. As teachers proceed through their careers, they deepen and extend their repertoires of effective teaching techniques in order to orchestrate and inspire student learning. Jamie McKenzie; FNO Press; 2005"